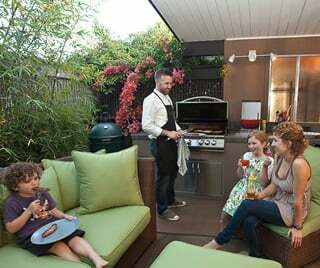 Sunnyvale Eichler owner Peter Ford, above with wife Tera and children Tobin and Emma, at their outdoor kitchen. 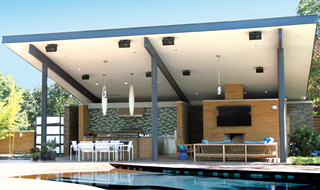 This very dramatic modern outdoor setting, designed by Domiteaux + Baggett Architects of Dallas, Texas, has it all: kitchen, dining and entertainment areas, and pool. 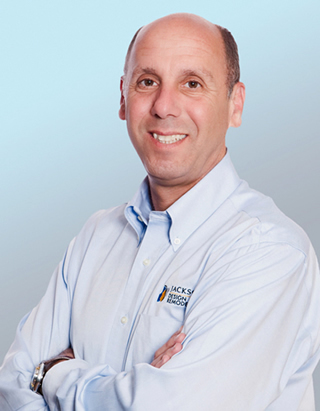 Architect Jim Groen of Jackson Design and Remodeling. The temptation of sizzling steaks and flash-fired vegetables, especially during the summer months, entices many honest home cooks to cheat on their indoor cooktop in favor of the open flame. There’s something wonderfully primal about the smoky smells wafting from the grill that transform home cooks—who would otherwise pussyfoot around the kitchen with Julia Child recipes in hand—into tong-wielding iron chefs on the wild side. Since California dwellers enjoy the good fortune of having a pleasant climate almost year-round, it never seems quite right to chop and prep all the ingredients indoors only to walk outside to grill them. A proper outdoor kitchen lets homeowners do all the cooking—from prep and sear to serve and clean—in the great outdoors. “For a while we’ve discussed how we should bring the outdoors in, but now almost everyone we run into wants to create some sort of living and cooking space outside,” says Jim Groen, an architect with Jackson Design and Remodeling in San Diego. Peter Ford, a Sunnyvale Eichler owner who’s also a cooking enthusiast, discovered the benefits of cooking outside while he was remodeling his home’s kitchen. He and his wife Tera decided to invest in an outdoor cooking space so that they could prepare meals at home during the remodel, right under the sun and stars. The couple opted to build their outdoor kitchen in the 12-by-15 courtyard area at the front of their Eichler. Ford called on Unlimited Outdoor Kitchens in San Jose to help him figure out how to lay out the space. “We didn’t want to break the bank, so we opted to do one long ten-foot area that would offer counter space, storage, and refrigeration,” Ford says. “We left a two-foot space at the end for the Big Green Egg [charcoal cooker].” The Fords tore down an old latticework fence before installing new fencing, and used Trex composite decking for the flooring. Low-maintenance ceramic tile covers the countertop, and the cabinet fronts are stainless steel. All told, the Fords spent around $7,000 on the outdoor cooking space, allowing them to whip up alfresco meals in any season.